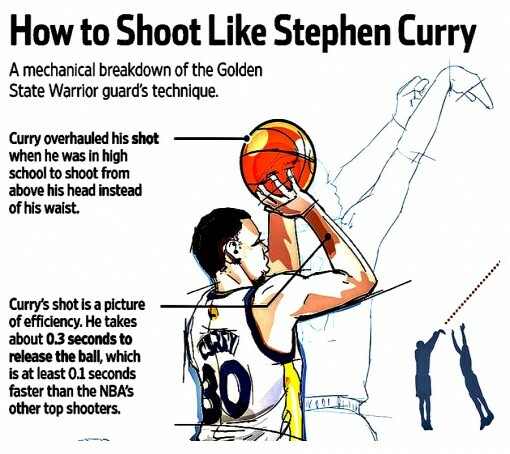 There’s no way Steph Curry can be the best shooter in NBA history already, can he? Opinions aside, there’s a ton of numbers that support that claim. After just 5 1/2 seasons in the NBA (he missed the majority of the 2011-12 season with injuries), Curry already owns three of the top five spots for total threes made in one season. With just six(ish) seasons under his belt, Curry is not only one of the most prolific three point shooters in NBA history, but he’s pretty freaking accurate. Though Steve Kerr (45.4%) and Hubert Davis (44.09%) rank above Curry (44.05%) in terms in career three-point percentage, those two haven’t shot nearly as many threes as the 2014-15 NBA MVP. In fact, if Curry shoots another 600 threes next season, he’ll have as more attempts as Kerr (1599) and Davis (1651) combined by the end of the 2015-16 season. For context, Curry is a better shooter from three than some players are overall. His three-point mark is higher than the the career field goal percentages of Allen Iverson, Jason Kidd and Tracy McGrady. The 44% accuracy from distance is the same as Paul Pierce’s and Vince Carter’s career FG%. It’s not to diss those players, but to put what Curry is doing on the court into perspective. It’s not just the regular season that Curry is setting the nets on fire, but in the playoffs, he’s already nearing the record for most threes in one postseason. He currently sits one measly three-pointer behind Reggie Miller’s record of 58 threes in a postseason. The kicker? It took Miller 22 games to reach 58 threes while it’s only taken Curry 12 playoff games to sink 57 threes.